« (PHOTOS) Say ‘Konnichiwa’ to Kamisu Park, Eureka’s Newly Dedicated Green Space! Mad River Community Hospital last week fired close to a dozen employees, including medical assistants, office staff and two nurse practitioners, according to several sources reached by the Outpost. 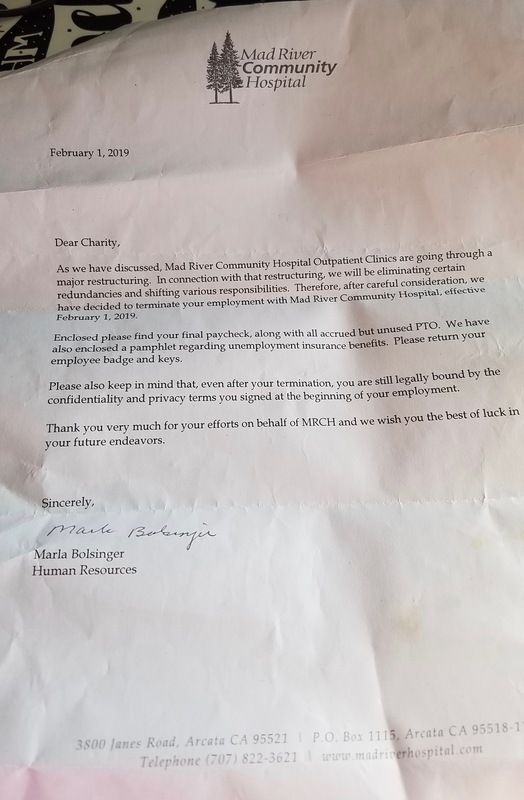 [A]fter careful consideration, we have decided to terminate your employment with Mad River Community Hospital, effective Feb. 1, 2019 [that same day]. Enclosed, please find your final paycheck, along with all accrued but unused PTO [paid time off]. We have also enclosed a pamphlet regarding unemployment insurance benefits. Please return your employee badge and keys. “I was in complete shock,” said Punch, who had been employed full-time at the hospital since May 2017. Punch said hospital administrators have been saying the outpatient clinics are losing money. These off-site medical centers include the Mad River HealthCare Clinic in Arcata, the Humboldt Family Medical Clinic in McKinleyville, and the Six Rivers Medical Clinic in Willow Creek. “They told us over and over again that the clinics are losing money and they need to cut costs,” Punch said. The Outpost made numerous attempts Tuesday to reach someone at Mad River Community Hospital who could answer some questions. Eventually we received an emailed statement from the marketing/PR department that says, in part, “The path of generating new energies into updating and sustaining our clinic system unfortunately involved a minimum reduction of clinic staff.” The statement does not say how many people lost their jobs. The sources we spoke with said that number was between 10 and 15. The Outpost has requested an interview with hospital management to get more information. We’ll update if we hear back. There seems to be a disconnect somewhere in the system that’s making it challenging for patients to actually get into the clinics and get seen, she said. People in Humboldt County frequently have a hard time finding primary care providers, she said, especially since many private practice doctors don’t accept Partnership HealthPlan, the region’s nonprofit care provider for Medi-Cal recipients. “[Patients] said I was their fourth provider, and they were glad I’d be there a long time,” the nurse practitioner said. Now she’s suddenly unemployed, and she was not allowed to notify her patients that she’d been fired, she said. She was told that her patients would be referred to another provider. Mad River Community Hospital faced pointed criticism last summer after administrators chose not to renew the employment contract of pediatrician Dr. Catherine Poterack. Poterack told Redwood News last summer that she’d built the hospital’s pediatrics care “from the ground up” and believed she was let go for financial reasons. An email from a current employee, who wished to remain anonymous for fear of retaliation, said Poterack’s forced departure left hundreds of sick children without a pediatrician. Punch said hundreds more patients will be affected by last week’s layoffs. She’s also facing some medical repercussions of her own. Due to the ongoing challenges in the healthcare industry, Mad River Community Hospital has determined that there is a need to centralize our clinic services to better meet patient healthcare needs in our local community. Over the past year, to enhance our clinic services, the hospital has been researching various options including upgrading our electronic medical records, improving data reporting and monitoring, and recruiting additional healthcare providers. The path of generating new energies into updating and sustaining our clinic system unfortunately involved a minimum reduction of clinic staff. We are truly saddened to see our former employees leave and are grateful for the contributions they have made. We wish them the best in their future endeavors.